Lessons 11 and 12 – The week ends with a splash – literally! Ironic I know, but because of the Labour Day holiday a few weeks ago we have to do two classes in one day. No one has been looking forward to it. The day starts with a demo, then after a break we do the two practical classes back to back with maybe time for a quick coffee in between. It’s very early in the day to be watching Chef take the skin off a calf liver. The skin’s supposed to come off in reasonably sized pieces but it doesn’t. He persists with great patience. I’m more excited about the French fried onions being served with it and the vanilla bavarois to come later. There aren’t the usual ‘ohs’ and ‘ahs’ at liver-tasting time. The bacon is deliciously salty and crisp. Chef names a few cafes which he knows will consistently serve crispy bacon. 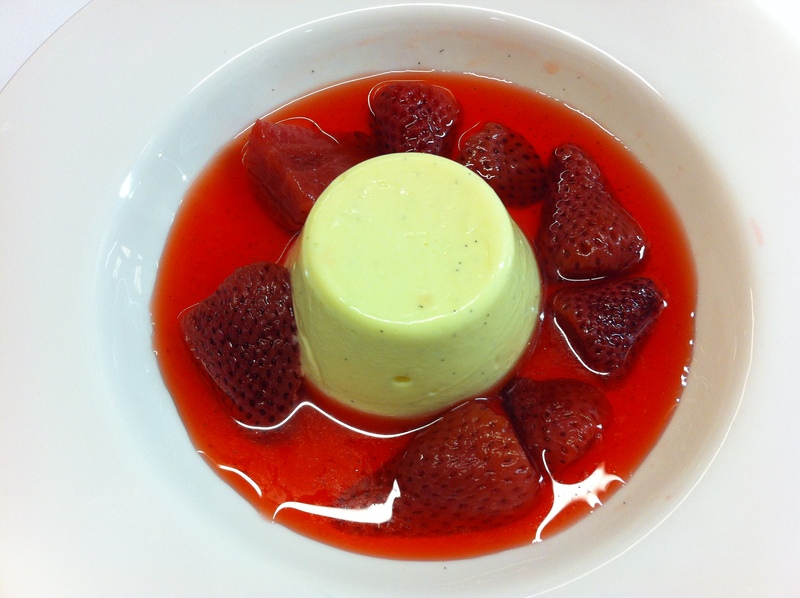 We drool over the bavarois. It’s similar to a panna cotta. It is seriously good with an even smooth texture. But surprise surprise! it’s a bit trickier to make. There is a need to be very precise about the temperature, there’s straining, cooling over ice, and mixing the ingredients so it thickens. Then it’s essential to get it into the moulds before it sets. With my beautiful looking bavarois completed, I get the liver out of the fridge. As with Chef’s, our liver doesn’t want to part with its skin. We get enough taken off to make just enough portions for the dish. 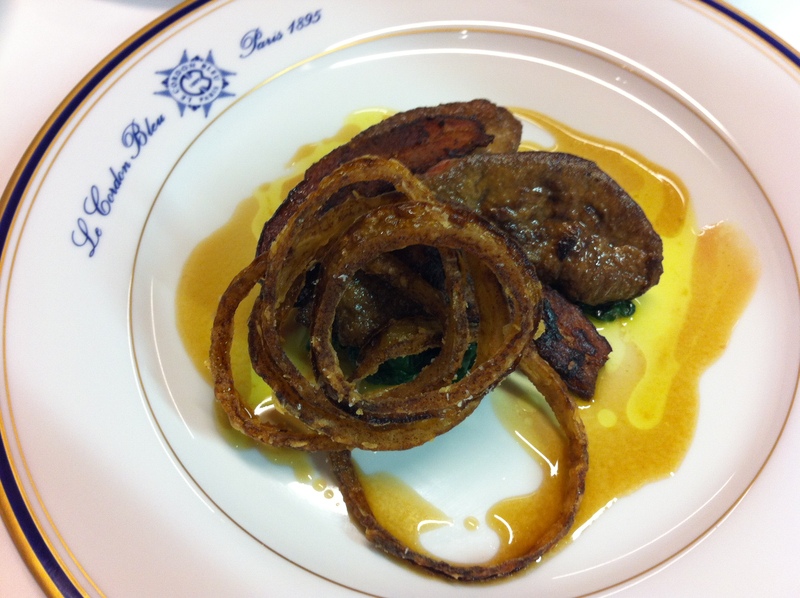 There’s lots of talk about the quality of the spinach that we are serving with the liver. It gets taken away and replaced. Others are deep frying the onion rings. We’re all working fast today knowing that we have to get all the dishes done and be back for another practical. I’m thrilled with the bavarois but the calf’s liver looks slightly overdone – something we were warned about. The onion rings are delectable but I mustn’t eat anymore or there’ll be none left for the plate. The next practical is technically quite hard. 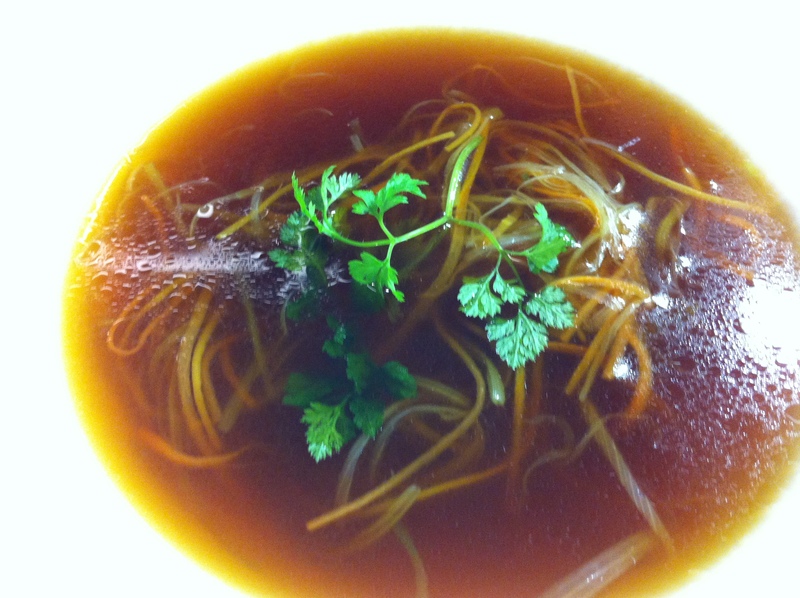 We make consommé de boeuf with a julienne garnish. It’s got to be clear and free of any impurities. The clarification process involves using an egg white mixture to capture any bits from the stock to bring them to the surface. It can go very wrong and the solid ‘raft’ forming on the top can collapse. Chef is pleased and as surprised as the rest of us that it’s a 100 per cent strike rate. I’m on track to serve on time and just need to puree the pumpkin and add a liaison before passing the consommé. The blender doesn’t work so I check the plug. It’s not in properly. Yep, the switch on the blender itself was still on. 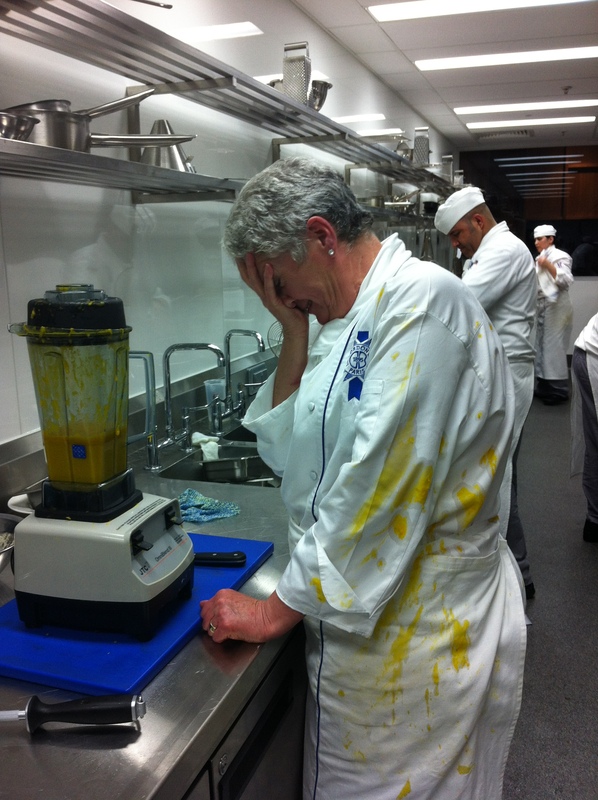 Like Mount Vesuvius with a huge roar the lid explodes off the top and molten pumpkin spews out over me, the bench, the walls….. Before I have time to wish for the floor to open up, Chef is beside me like a white-clad superman (minus the tights). After he’s checked that only my pride is hurt, he helps me clean up. There are pitying looks from around the room and I just know they are thanking the God of Cuisine that it didn’t happen to them. Chef says he’s done it and a world famous chef (who will remain nameless) has also done it. It takes three washes in Napisan to get the pumpkin out, but I will be back in the lecture theatre on Monday in my crisp white uniform, and I swear to God that the blender will never get me again. Chef is right, most of us have experienced it and wonderful that he a good tutor that he shares that with. It’s always good to have funny stories to tell in future! Thanks Allison, I am sure the story will get embellished in true journalistic style as the years go by. Oh dear, I wish I had been a fly on the wall. You’ll never be able to make pumpkin soup again without remembering this “malfunction”!! So right. I call it the curse of the blender. Where was the puréed pumpkin going anyhow? Surely not into the consommé? Sounds like a very busy day – and a very good tutor! Been there and done it. Feel your pain. At least I was on my own and could lick my pride in quiet. Seems to me that Chef is on your side supporting rather that yelling at your mistake which is so heartening to hear and so unstereotypical of what we are led to believe about chef’s in kitchens. Shame you weren’t partial to the liver – yum, my fav. Lucky they let you stay in the course!